The miniature glass electrode has many applications in general purpose analysis and in biochemical studies. The Trigno EKG Sensor from Delsys is used to measure and wirelessly transmit (≤ 40 m) surface EKG (ECG) signals to the Trigno Wireless Foundation System. Ideal for teaching applications, the transmitter has an ergonomic design and transmitter that transmits at a range of 1.2 m (4 ft). The Trigno 4 Contact FSR (Force Sensitive Resistor) Sensor from Delsys with suitable sensor contacts are designed to simultaneously record up to four voltages corresponding to applied force (0.1 N - 10 N) under varieties of conditions. The Light Meter Probe is a fast response, directional specific, visible light meter probe. A dip-in electrode is used to measure the conductivity of biological fluids like water, urine, and physiological fluids. A fast-response 1 cm long 29 gauge needle thermocouple probe, which can be used for measuring temperatures up to 200°C in tissues, semi-solids and liquids. 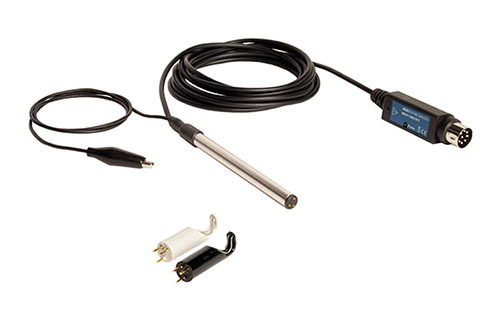 The RTD Temperature Probe measures the temperature of fluids in the range of -60 to 200 °C. 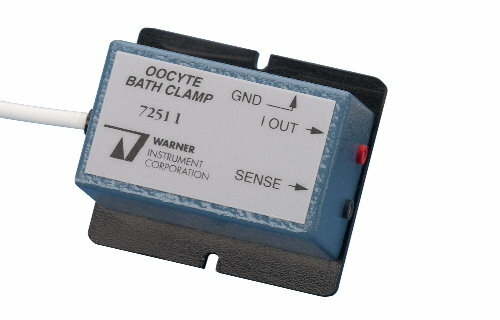 These headstages are for use with the Oocyte Clamp Amplifier. A range of Flowprobes and Flowsensors are available to measure fluid flow in laboratory tubing; blood flow in vessels of various diameters; and cardiac output in acute and chronic preparations. PhysioTelTM HD Implants from DSI are the most advanced small animal telemetry products available on the market today. PhysioTelTM HD Implants from DSI are the most advanced mouse (miniature) telemetry products available on the market today.